Here is a recent illustration I did. I want to make a whole series of character from this world. This would be a warrior in a culture of elephant like beings. Using only brute force and their thick skin to protect what keeps their culture progressing. 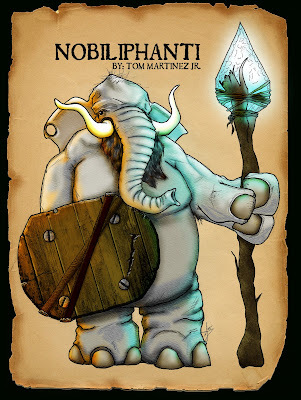 Noble and trustworthy, the Nobiliphanti is the guardian of its people. Inspired by the Hindu Ganesha and Little John from Robin Hood, yes the Disney version.